The term ‘hack’ is being used a lot lately. While it used to have a negative connotation, these days to ‘hack’ is to find a quicker, easier and more effective method for achieving a goal. There are life hacks (like packing Christmas ornaments in empty egg cartons), food hacks (like placing a handful of cherry tomatoes between two plates and using a knife to halve them all in one fell swoop), and as I’ll share with you today, fat loss hacks. Serve shredded, sautéed cauliflower as rice, rather than traditional brown or white rice. This simple hack will save you hundreds of calories per meal and will leave you no less satisfied. You can even add your favorite spices and flavor additions as you do with traditional rice. There are many ways to create and enjoy noodles made from vegetables, rather than noodles made from grains. The veggie noodles are a hundred times less fattening than grain-based noodles, so what are you waiting for?! Use a spiral slicer to turn zucchini or butternut squash into noodles; bake a spaghetti squash and scrape out those nature-made noodles; or simply use a traditional veggie peeler to create long noodle strips from zucchini. By simply replacing your sliced bread and buns for large pieces of lettuce, you’ll quickly eliminate a couple hundred calories from each meal. Once you get used to the crunch of the lettuce you’ll enjoy your new style of sandwich and burger even more than the traditional way. Did you know that protein powder can be used in many recipes to increase the protein and reduce the carbs? Replace a portion of the flour in your pancakes with high quality protein powder and you’ll see how delicious it tastes while being so much healthier for you. Replace the vegetable oil in your kitchen with coconut oil, and enjoy benefits such as increased fat burning and reduced appetite. In addition, you’ll be avoiding the pitfalls of other, less healthy oils and fats. Coconut oil can be used in virtually any recipe – both stove top and baking. Throw the refined sugar out of your kitchen and replace it with any one of these wholesome sweeteners: coconut sugar, raw honey, pure maple syrup, or pitted dates. By getting your sweet fix from these wholesome, real food sweeteners you’ll be taking in fewer calories and there will be less of an impact on your blood sugar, which will result in less fat stored. Replace high calorie beverages with crystal clear water. This simple hack could quite possibly change your life. If high calories, sugar-laden beverages make up a significant part of your daily calories then switching to water will swiftly induce fat loss. 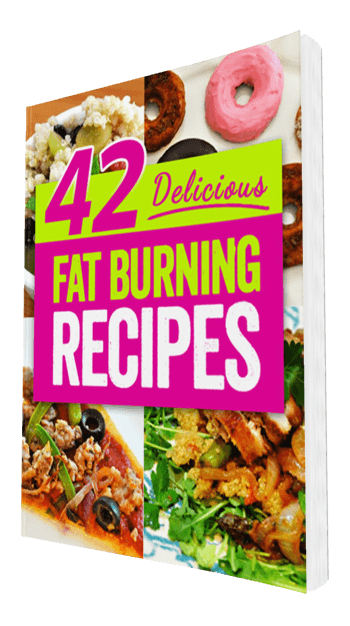 Start using these Fat Burning Meal Hacks today and enjoy a leaner physique. Let me know when your jeans start to feel loose around the waist!A consistent, challenging exercise program, like the ones that I provide for my clients, is the only way to achieve and maintain your ultimate fat loss goal. If you’re on the fence about starting one of my programs today then call or email for the details.Let me be your #1 secret weapon in fat loss. Your Ticket to Get Fit! Come give my fitness program a try. I have the whole fat loss equation down to a science, and I’d love nothing more than to help you achieve your fitness goal. My workouts have been known to burn up to 500 calories at a time, so what are you waiting for? If you haven’t yet added frittatas to your dinner rotation then here’s the perfect recipe to start with. 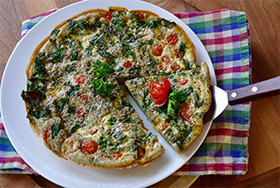 While this recipe calls for kale and tomatoes, frittatas can be made with whatever vegetables and meat you have on hand, simply chopped and thrown in to the egg mixture. It’s a great way to eat low carb and high protein. Enjoy! 2. In a large bowl whisk the eggs, egg whites, sea salt, black pepper, nutritional yeast and oregano. 3. Coat an 8-inch oven-safe skillet with the olive oil. Place over medium heat and add the kale and tomatoes. Cook for 4 minutes, until soft. Swirl in the egg mixture then remove from heat. 4. Transfer the skillet to the oven and bake until set, about 20 minutes. Slice into wedges and serve. Enjoy!